Last night at church we started a new study on the names of God. We discussed how the over 300 names of God in the Bible have gone from being highly revered to being watered down in today's world. In fact, the name of God has become so 'water-down' that it is used all the time in nondescript and disrespectful ways. His name is used as a curse word. I almost think that the name of God is used as a curse word or in a flip manner more often than it is used in reverence as referring to the One True God. In Bible times as well as today, Jews do not speak the name of God in reverence to the Name. But today, everywhere you turn, someone is using God's name in a way that would lessen His greatness! God is and always was. He is all powerful, ever present and the Creator of the universe! By using His name as a curse word or as an exclamation point, we are lessening the wonder that is God. I catch myself sometimes as I use God's name as an exclamation point. 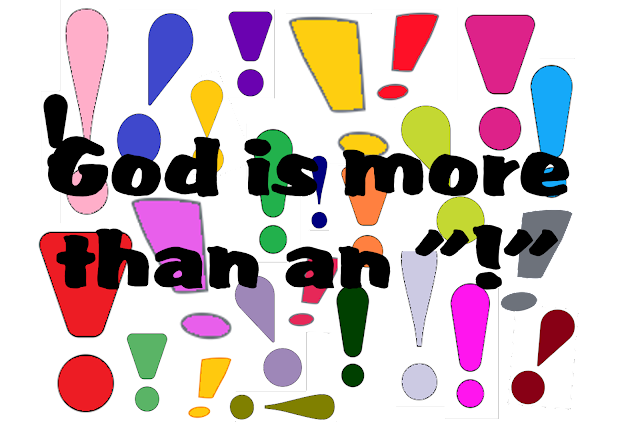 How do we use God's name as an exclamation point? When we see a near miss accident on the street and we say, "Oh, my Lord!" That's using God's name as an exclamation point. When we say, "Oh, my God!" or "o.m.g.!" it is using God's name as an exclamation point. God is so much more than that. All of this was discussed last night in service and it made such an impact on me that I can't stop thinking about it. I can't stop feeling panic at the possibility that I've caused pain to my God with my nonchalant use of His name. I also feel like we've lessened the sacredness of the sanctuary. In today's world many churches are 'all-purpose' buildings. And as such, I feel like the reverence in the 'sanctuary' is lost. Our church is in a store front building. We've done a lot of work to make it look and feel like a church, especially the sanctuary. I don't like seeing kids ripping and running through a church sanctuary. I don't like seeing people play ball in the sanctuary. Perhaps it's just me, but I believe that the sanctuary of a church should be as respected as the name of the God we worship in that sanctuary! "God, help me to always respect Your name and the place where we worship you. Help me to speak Your name in such a way that others would see Your greatness!"